U.S. goods and services trade with China totaled $539 billion in 2011. Exports totaled $129 billion; Imports totaled $411 billion. The U.S. goods and services trade deficit with China was $282 billion in 2011. 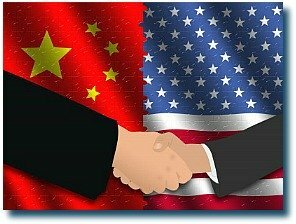 China is currently our 2nd largest goods trading partner with $503 billion in total (imports and exports) goods trade during 2011. Goods exports totaled $104 billion; Goods imports totaled $399 billion. The U.S. goods trade deficit with China was $295 billion in 2011. Trade in services with China (exports and imports) totaled $36 billion in 2011 (preliminary data). Services exports were $25 billion; Services imports were $11 billion. The U.S. services trade surplus with China was $13 billion in 2011. U.S. goods imports from China totaled $399.3 billion in 2011, a 9.4 % increase ($34.4 billion) from 2010, and up 299% since 2000. It is up 290% since 2001. U.S. imports from China accounted for 18.1% of overall U.S. imports in 2010. By 2011, China was still one of the top trading partners of US importation. Table below is updated by United States Census in 2012.